In Norse mythology, Frigg or Frigga was said to be "foremost among the goddesses," wife of Odin, Queen of the Aesir, and goddess of the sky. As one of the Ásynjur (female Norse divinities), she was a goddess of fertility, love, household management, marriage, motherhood, and domestic arts (though another Norse goddess—Freyja—was more commonly associated with some of these domains). Frigg's primary roles in Norse mythology celebrate her actions in familial roles, as the wife of Odin and as the mother of Balder. 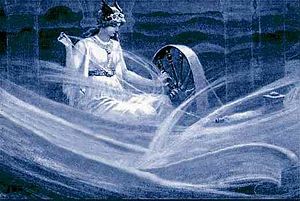 As a Norse deity, Frigg belonged to a complex religious, mythological and cosmological belief system shared by the Scandinavian and Germanic peoples. This mythological tradition, of which the Scandinavian (particularly Icelandic) sub-group is best preserved, developed in the period from the first manifestations of religious and material culture in approximately 1000 B.C.E. until the Christianizing of the area, a process that occurred primarily from 900-1200 C.E. Though some scholars have argued against the homogenizing effect of grouping various traditions together under the rubric of “Norse Mythology,” the profoundly exploratory and nomadic nature of Viking society tends to overrule such objections. As Thomas DuBois cogently argues, “[w]hatever else we may say about the various peoples of the North during the Viking Age, then, we cannot claim that they were isolated from or ignorant of their neighbors…. As religion expresses the concerns and experiences of its human adherents, so it changes continually in response to cultural, economic, and environmental factors. Ideas and ideals passed between communities with frequency and regularity, leading to and interdependent and intercultural region with broad commonalities of religion and worldview.” The tales recorded within this mythological corpus tend to exemplify a unified cultural focus on physical prowess and military might. Within this framework, Norse cosmology postulates three separate "clans" of deities: the Aesir, the Vanir, and the Jotun. The distinction between Aesir and Vanir is relative, for the two are said to have made peace, exchanged hostages, intermarried and reigned together after a prolonged war. In fact, the most significant divergence between the two groups is in their respective areas of influence, with the Aesir representing war and conquest, and the Vanir representing exploration, fertility and wealth. More specifically, Georges Dumézil, one of the foremost authorities on the Norse tradition and a noted comparitivist, argues quite persuasively that the Aesir / Vanir distinction is a component of a larger triadic division (between ruler gods, warrior gods, and gods of agriculture and commerce) that is echoed among the Indo-European cosmologies (from Vedic India, through Rome, and into the Germanic North). Further, he notes that this distinction conforms to patterns of social organization found in all of these societies. The Jotun, on the other hand, are seen as a generally malefic (though wise) race of giants who represented the primary adversaries of the Aesir and Vanir. Frigg's main roles in the Norse pantheon are as the queen of the Aesir and the wife of Odin. Call her Daughter of Fjörgynn, Wife of Odin, Mother of Balder, Co-Wife of Jörd and Rindr and Gunnlöd and Gridr [all consorts of Odin], Mother-in-law of Nanna, Lady of the Aesir and Asynjur, Mistress of Fulla [her handmaiden] and of the Hawk-Plumage and of Fensalir [her hall]. Sturluson's descripton alludes to the secondary place of women in Nordic mythology. Indeed, Sturluson suggests that "all the goddesses may be paraphrased thus: by calling them by the name of another [most often their father or husband], and naming them in terms of their possessions or their works or their kindred. Frigg's children were said to be Balder, Höðr and, in an English source, Wecta; her stepchildren were Hermóðr, Heimdall, Tyr, Vidar, Váli, and Skjoldr. According to the poem Lokasenna, Frigg is the daughter of Fjorgyn (masculine version of "Earth," cf. feminine version of "Earth," Thor's mother), though her mother is not identified in the stories that have survived. Frigg is said to possess the power of prophecy, although she is entirely closed-lipped about what she knows. "She will tell no fortunes, yet well she knows the fates of men." and is the only being (other than Odin) who is permitted to sit on the high seat Hlidskjalf ("doorway-bench" or "watchtower") and look out over the universe. Frigg's hall in Asgard is Fensalir, which means "Marsh Hall." Although this may imply that marshy or boggy land was considered especially sacred to her, such an attribution is mere speculation. The most famous story featuring Frigg has her predominantly in the role of a mother. Frigg especially loved her son Balder, and, with a mother's concern, she set about trying to protect him after he had a prophetic dream of his own death. She had every living thing in the world promise not to harm him, except the mistletoe, which seemed too insignificant to bother with at the time. Later, the gods made a game of throwing things at the seemingly invulnerable Balder and watching them bounce off without hurting him. However, this pastime soon became deadly when Loki gave a mistletoe dart to Balder's blind brother Höðr and offered to help him take part in the festivities. With Loki's guidance, the blind god threw the dart and it pierced his brother's heart, killing him instantly. Even though Frigg must have known that Balder was doomed because of her own precognitive abilities and her son's prophetic dreams, she nonetheless tried to alter his fate. After his death, she sent an emissary (Hermodr) to the Underworld to speak to its queen (Hel), in an attempt to ransom her unfortunate son. The icy queen agreed to release Balder on the condition that all living things weep for him. In a parallel to her initial quest, Frigg then spoke to everyone and everything in the world, all of whom agree to weep for the beloved god of spring. However, the last being to be petitioned, a giantess named Thökk, refused to weep, saying: "Living or dead, I loved not the churl's son. Let Hel hold to that she hath!" It should be noted that Sturluson considers this giantess to be Loki in disguise. With that, Balder was lost to the world forever. In a story from the Historia Langobardum of Paulus Diaconus, Frigg is, once again, shown in the role of wife, but as one who knows how to get her own way (in spite of her strong-willed husband). In this story, the narrator describes a conflict between two Germanic tribes, the Winnilers and the Vandals. The latter group was a favorite of the All-Father, while the Winnilers were supported by Frigg. After a heated discussion with his wife (concerning their respective clients), Odin swore that he would grant victory to the first tribe he saw the next morning upon awakening, knowing full well that the bed was arranged so that the Vandals were on his side. While he slept, Frigg told the Winniler women to comb their hair over their faces to look like long beards, so that they appeared to be an army of men. She also turned her husband's bed, so the Winniler women would be on Odin's side. When he woke up, Odin was surprised to see the horde of unfamiliar, bearded men outside of this window and asked his wife who these "long-beards" were. In an etiological sense, this myth explains the origin of the name "Langobards" (literally "long beards," by saying that the group changed its appellation in honor of their new divine sanction. Outsmarted, Odin kept his oath and granted victory to the Winnilers, eventually admitting the wisdom of Frigg's choice. An even more provocative account (from the Gesta Danorum) describes Frigg desecrating a golden statue of Odin in order to reclaim the gold for jewelry. Unable to take down the statue herself, she enlists the aid of a servant by seducing him. These accounts are rather incompatible with the general picture of Frigg as a loving wife and mother (as characterized throughout the majority of sources). Given the similarities between Frigg and Freyja, with the former as the highest goddess of the Æsir and the latter as the highest goddess of the Vanir, it is perhaps unsurprising that scholars have debated a possible relationship between them. Specifically, many arguments have been made both for and against the idea that Frigg and Freyja are really the same goddess. 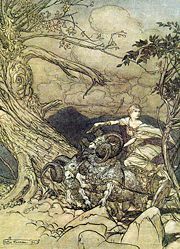 Some arguments are based on linguistic analyses, others on the fact that Freyja is only mentioned in Northern German (and later Nordic) accounts, while still others center on specific mythic tales. However, both goddesses sometimes appear in the same text. Further evidence of Frigg’s importance can be found in surviving toponyms, many of which can be found in Sweden (i.e. Friggjarakr ("Frigg's Cornfield") in Västergötland). In addition to these Swedish toponyms, archaeologists have also found an abandoned Norwegian farm (ca. 1435), whose name (Friggjarsetr) can be translated "Frigg's homestead." However, this find is somewhat irregular, as no other Friggic toponyms have been found in Norway. The constellation Orion was once known as "Frigg's Distaff" (Friggerock). To explain this attribution, some scholars have pointed out that the constellation is on the celestial equator and thus the stars rotating in the night sky may have been associated with Frigg's spinning wheel. 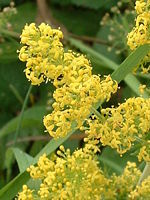 Given the goddess's association with women and childbirth, the Scandinavians named Lady's Bedstraw (Galium verum), a plant commonly prescribed as a sedative for the mother during childbirth, Frigg's grass. ↑ Sturluson, Prose Edda, Gylfaginning. ↑ Sturluson, Skáldskaparmál XIX, Brodeur 129. ↑ Sturluson, Prose Edda, Skáldskaparmál. ↑ Simek, 93-94; Lindow, 128-130. ↑ Sturluson, Gylfaginning XLIX. Brodeur 70-75. ↑ Sturluson, Gylfaginning XLIX. Brodeur, 75. ↑ Northvegr Foundation, History of the Langobards. Retrieved May 14, 2007. ↑ Orchard, 120; Northvegr Foundation, History of the Langobards. Retrieved May 14, 2007. ↑ Sturluson, Ynglinga Saga 3; Northvegr Foundation. The Ynglinga Saga. Retrieved May 14, 2007. ↑ Davidson, 10; Grundy, 56-67; Nasstrom, 68-77. ↑ Encyclopedia Mythica, Origin of the Names of the Days. Retrieved May 15, 2007. ↑ Lindow, 129; Turville-Petre, 189. Bellows, Henry Adams, trans. "Völuspá." In The Poetic Edda. Princeton: Princeton University Press, 1936. The Poetic Edda. Retrieved May 15, 2007. Björnsson, Eysteinn, ed. Snorra-Edda: Formáli & Gylfaginning: Textar fjögurra meginhandrita. 2005. SNORRA-EDDA: FORMÁLI & GYLFAGINNING. Retrieved May 15, 2007. Grammaticus, Saxo. The Danish History (Volumes I-IX). Translated by Oliver Elton. New York: Norroena Society, 1905. Accessed online at The Online Medieval & Classical Library, The Danish History, Books I-IX. Retrieved May 15, 2007. Krupp, E. C. "The Thread of Time." Sky and Telescope 91(1), January 1996: 60. Munch, P. A. Norse Mythology: Legends of Gods and Heroes. In the revision of Magnus Olsen; translated from the Norwegian by Sigurd Bernhard Hustvedt. New York: American-Scandinavian Foundation; London: H. Milford, Oxford University Press, 1926. Schön, Ebbe. Asa-Tors hammare, Gudar och jättar i tro och tradition. Värnamo: Fält & Hässler, 2004. Smith, John B. "Perchta the Belly-Slitter and Her Kin: A View of Some Traditional Threatening Figures, Threats and Punishments." Folklore 115(2), August 2004: 167–186. Sturluson, Snorri. The Prose Edda. Translated from the Icelandic and with an introduction by Arthur Gilchrist Brodeur. New York: American-Scandinavian Foundation, 1916. Accessed online at Northvegr Foundation, The Prose Edda. Retrieved May 15, 2007. The Face of the Goddess. Shadowlight. Frigg's twelve handmaidens and associated signs of the zodiac. This page was last modified on 13 May 2017, at 21:10.